There's an undeniable fascination with looking at the highest income levels and their tax payments. Adrian Dungan provides a glimpse in "Individual Income Tax Shares, 2014," which was published in the IRS house journal Statistics of Income Bulletin (Spring 2017, pp. 12-23). 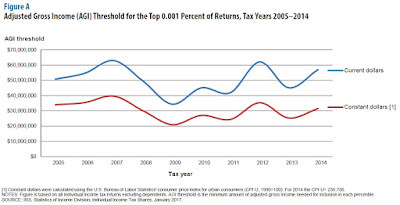 Here's a figure showing the share of returns and the share of income taxes paid. For example, the top 1% of income tax returns in 2014 accounted for 20.6% of all income, but 39.5% of all income tax. The top 50% of all tax returns accounted for 88.7% of all income and 97.3% of all income tax. Which in turn implies that the bottom half of all tax returns accounted for 11.3% of all income and 2.7% of all income tax. Here's a figure focused on the very upper end of this distribution. About 137 million tax returns were filed in 2014. 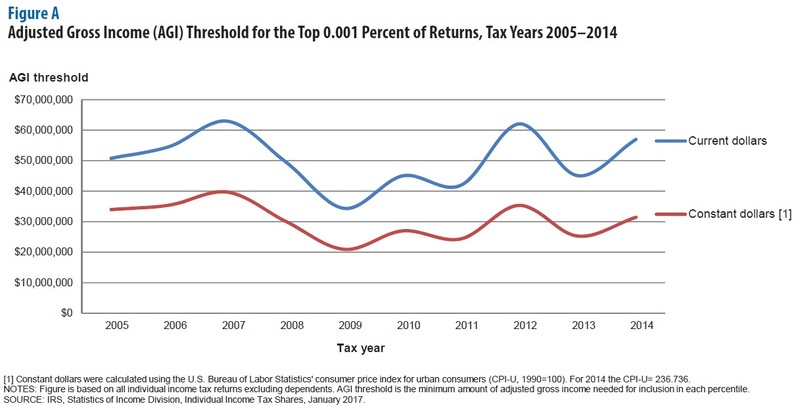 Thus, the top 1% of those returns refers to the top 1.37 million tax returns; 0.1%, the top 137,000 returns; 0.01%, the top 13,700 returns; and 0.001%, the top 1,370 returns. The bars for the top 1% show the same numbers as in the figure above. But the top 0.001% accounts for 2.1% of all income and 3.6% of all income taxes. What are the income levels for these different groups? The top 10% kicks in at about $130,000; the top 1% is at $460,000. At the extreme upper end, the top 0.001% of tax returns reported income of nearly $60 million in 2014. Finally, here's some information on the average income tax rates paid by those in the highest brackets. 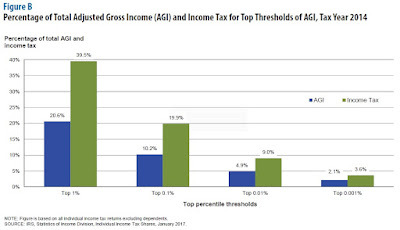 A few points are worth noting here: 1) This is an average tax rate, not a marginal tax bracket--so these people are paying much higher tax rates on the marginal dollar; 2) Average taxes on those with very high incomes rose in 2012; and 3) The very highest income levels of 0.01% and 0.001% have slightly lower average tax rates, probably because these very high levels of income are likely to take the form of long-term capital gains that are taxed at a lower rate than regular income. A few words of warning are appropriate before over-interpreting the figures here. These figures and percentages apply only to federal income tax. They do not cover the federal payroll taxes that fund Social Security and Medicare, nor do they cover state and local taxes like sales, property, and income taxes. Thus, the figures do not show overall tax burden. The higher burden of income taxes on those with high income levels, as a share of their incomes, can be thought of as counterbalancing how other major taxes like sales tax and payroll taxes weigh more heavily on those with lower incomes, as a share of their incomes.